Those books can either be downloaded in the Book web page, or created thanks to PictoDS or pycbds. Different themes are available in this page. Go here to go directly to download section. This User Guide explains the "Right Handed" mode, associated with a "Left To Right" Reading. Orientation is "Landscape". Default key configuration is used. For the "Left Handed" Mode , the "Portrait", and the "Right To Left" reading, the behaviour is almost the same but the key configuration may differ. This mode displays the available comicbooks. The thumbnails can be selected using the pad or the stylus. A selected thumbnail is then displayed in overview on the other screen. To display the book in real size, you must either press the L button or click on an already selected thumbnail. Thanks to the Save icon you can save the current pages number of all the comic books (if needed). Thanks to the Thumbnails icon you can switch to THUMBNAILS MODE. This mode displays the small images 10 by 10. Those thumbnails can be selected using the pad or the stylus. A selected thumbnails is then displayed in overview on the other screen. 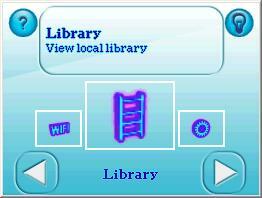 Thanks to the Library icon you can switch back to LIBRARY MODE. To display the next (or previous) 10 thumbnails, you can either click on the small hands or you can use the pad (while going on the right with the last image selected, or on the left with the first one selected). To display a thumbnail in real size, you must either press the L button, press the view icon or click on an already selected thumbnail. The OVERVIEW mode displays a part of the image in real size on one screen and a overview on the touch screen. Pressing again the L button will set the DUAL SCREEN MODE. This mode displays the image in real size on both screens. You can move the stylus on the touch screen to change the displayed area. The pad can also be used to change the displayed area. X and Y can be used to zoom in and out. Pushing both buttons at the same time will make the image real size (or will switch back to the previous zoom). If the icons are not displayed (in OVERVIEW and DUAL SCREEN MODES)you can click one of the corner of the touch screen and some icons will be displayed (during approximately two second). switch to DUAL SCREEN mode. switch to the THUMBNAILS mode. switch to the LIBRARY mode. Locks the icons. In order to make them remain visible on screen. Unlocks the icons. In order to make them visible only during approximately two second. Zoom In: makes the image bigger. Zoom Out: makes the image smaller. Cancel Zoom : makes the image realsize. Use the previous Zoom value (juste before the Cancel Zoom). Saves the current pages number of all the comic books (if needed). Zoom : ajust the zoom moving this icon on the scrollbar. You can change the default key configuration modifying the ComicBookDS.ini file. Mollusk and his PAlib library (as those who contributed to it). Wintermute and his work on devkitpro. Chism and his DLDI FAT access. Burton Radons, and headspin for their JPEG Decompression Library. Lick and his brightness control source code. Sansanx who allowed me to present his great Comic Book La Vie de Norman. Eric Caoili and his beautiful first review of ComicBookDS at www.4colorrebellion.com. The HomebrewCast team at http://homebrewcast.com/ team and their ComicBookDS review and comments :). Alex, the omalone and puzzlemaniak game author, who made me want to start programs for the DS. Everybody who like this program, moreover the ones who wrote good things about it in their blogs or forum posts. It has been reported that ComicBookDS V2.0 (and probably V2.1) is not compatible with Supercard Rumble and some M3 simply. I cannot do anything against that, as far as i know. The 2.0Beta 5 version should be the last compatible one. If, even after patching the file correctly with the DLDI library, ComicBookDS says that FAT is not possible, the problem might come from your SD card. It was reported that some SD cards (mainly the Kingston ones) could not work correctly with ComicBookDS. This Nintendo DS program should be used with the PC program PictoDS (allowing to convert the comic bookds for ComicBookDS) or with the python pycbds script. Copy the "cbds" directory in the root of your card. This "cbds" directory contains the theme directory (which can be changed) and the ComicBookDS.ini configuration file. This ini file can be changed manually in order to modify some ComicBookDS settings (you can alternatively update and generate it with PictoDS). Choose one of the 3 ComicBookDS files (ComicBookDS.nds, ComicBookDS.sc.nds, ComicBookDS.ds.gba) according to your flash cart and copy in your cart. If the program doesn't launch or reports that fat is not supported then you may have to patch it. Go there : http://chishm.drunkencoders.com/DLDI/ to find how to do it. The .cbds files (the books generated with PictoDS or downloaded from http://cbds.free.fr/) must be placed in the "cbds" directory. However, you can create some sub-directories to organise them. New: WIFI mode created. The books from http://cbds.free.fr/ can be consulted directly on the DS thanks to the WIFI connexion. New: Theme support: Sounds, Colors, Backgrounds, Icons and Sprites can be changed. All the theme content is placed in the "/cbds/Theme" folder. New: Quicker file scan (new restriction : all .cbds, .ini and theme files must be placed in the "cbds" root folder. Sub-folders are still handled). New: Improved change page trigger (using the one key navigation feature) : instead of an exact page side match, an average is used (1/3 of the visible area by default), to trigger or not a page change. New: Display of a notification icon before a page change. A second key press is then now necessary (this feature can be deactivated in .ini file). New: More configuration available in ini file (avoid blinking, initial brightness, scrollincrementX,scrollincrementY,start key configurable ...). New: Slightly better reactivity , preempting and error handling. Small bug fixes and improvements. New: Display of the folders and sub-folders containing .cbds files, for a better organization. New: Alphabetical Sort of the .cbds files, according to the filename. 3 background images are located in the "nds/ComicBookDSTheme" subdirectory of pictods. Copy them anywhere on your card (but all the 3 in the same directory), and you'll have those backgrounds displayed instead of the black one. New: Magazine (and vertical images) handling : While being on the bottom of the image, pressing the bottom key will move the visible area to the top on the right (of left in manga mode). Same behavior for the top. Page changed may also be triggered. New: Animated scroll of the Title/Author/Provider/Image name, when their length exceed the visible area. New: A random book can be selected pressing the dice icon (visible in library mode, when the top-most folder is displayed). New: Changes in the way the right/left hands icons are displayed, reflecting better that the first or final page is reached (mainly in the view modes). BugFix: As usual ... small bug fixes and improvements. BugFix: The images are now fully displayed. (there are no missing right and bottom parts of some images anymore). BugFix: Stylus Jumping effect is highly reduced. BugFix: Program shouldn't freeze anymore when quickly switching from one book to another. New: Thumbnails of the Library screen are loaded in background and they remain visible when switching between Library and Thumbnails modes. New: Renaming the .cbds files is not necessary anymore. 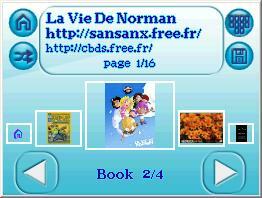 The .cbds files can have any name (eg : "La Vie de Norman.cbds") and can be placed anywhere. New: The Library screen is more reactive to user inputs. When the book is not opened yet, the filename is displayed. New: Current page name is displayed during image load. New: Do not wait for key release anymore in Thumbnails and Library screens. This allows a quicker thumbnails navigation while keeping the key pressed. BugFix: The Stylus (touch screen) can now be used with R4DS and M3 Simply. BugFix: Sometimes, the selection frame of miniature mode was not displayed. 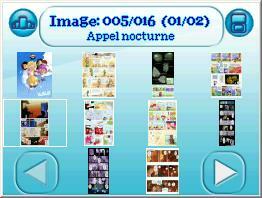 New: Quicker load of the thumbnails, miniature and images, once a comic book is opened (mainly for big .cbds files). New: Current page number is displayed during image load. New: A Warning message is displayed if there is not enough memory to fully decode the image. New: comicbookds.ini file generated with various settings allowing ComicBookDS customization. New: Multiple Books visible in the same application. A new screen is added, allowing to choose your Book. New: DLDI compatibility (http://chishm.drunkencoders.com/DLDI/) More carts should be compatible. New: The current Page number of the books can be saved. New: Sound effects on user action (and at program start). New: Previous zoom prev icon added (toggling with the No Zoom icon). New: Pressing both the zoom in and out buttons toggles 'no zoom' 'prev zoom'. New: Menu is navigable with keys. New: Display of a loading animated icon during image load. New: ComicBookDS icon (and appname) for the .nds file. New: Key configuration (manually editing the ComicBookDS.ini file). New: Icons locked by default. BugFix: Memory fix (loading bigger images should be allowed). New Web: Creation of http://cbds.free.fr/ to get some free cbds content. New: Progressive zoom feature. Image can be zoomed in and out using some buttons or the on-screen scrollbar. New: A lock icon is added. When locked, the icons remains on the screen. New: Closelit support. When the DS is closed, screens are switched off and energy is saved. New: Smoother animation for transitions. New: Key configuration changed, mainly for left handed landscape mode. Two buttons are also dedicated to the zoom feature (they were previously used for page change). BugFix: Fixed inverted thumbnails in Left Handed/Landscape mode. New: Screen Space option added (to take into account, or not, the space between the 2 DS screens). BugFix: Pressing select (backlight change) does not crash anymore. New: Images are now ordered according to a Numeric Natural Order ("1","2",...,"10" work. No need to have "01","02".."10"). New: Left Handed mode added (press start and change "Right Handed" to "Left Handed"). New: Manga mode added (press start and change "Left To Right" to "Right To Left"). New: Changing thumbnails with the arrow does not jump anymore some thumbnails. PC Converter released. Now, anyone can create his own Comic Book DS file. Release of the French Comic Book "La Vie De Norman" as a sample. ©cbds, Page updated Monday, 26. July 2010.